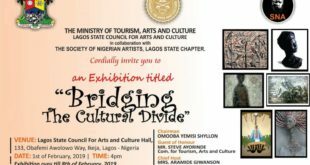 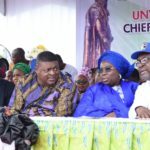 Representative of Lagos State Governor and Deputy Governor, Dr. (Mrs) Oluranti Adebule (6th left); wife of late Chief Gani Fawehinmi, Ganiyat (5th left); Human Right Activist, Dr Joe Okei-Odumakin (4th left); Commissioner for Tourism, Arts & Culture, Mr. Steve Ayorinde (3rd left); Special Adviser to the Governor on Tourism, Arts & Culture, Mrs. Aramide Giwanson (2nd left); Barr. 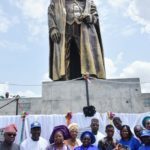 Femi Falana (6th right); Convener, Center for Anti-Corruption and Open Leadership (CACOL), Mr. Debo Adeniran (5th right); former Chairman, Amuwo Odofin LG, Mr. Adewale Ayodele (4th right) and others during the unveiling of Chief Gani Fawehinmi’s new statue in commemoration of his 80th Posthumous Birthday at the Ojota Park, Lagos, on Sunday, April 22, 2018. 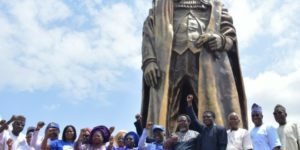 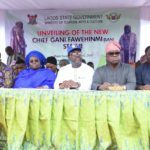 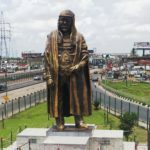 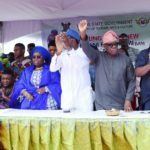 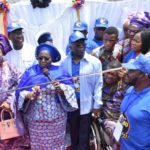 The new Chief Gani Fawehinmi’s new statue remodeled by the Lagos State Government and unveiled by Governor Ambode, in commemoration of his 80th Posthumous Birthday at the Ojota Park, Lagos, on Sunday, April 22, 2018.